NEW LIVE STREAM PLAYING CLASSIC SOUL AND CLASSIC HIP-HOP AND SMOOTH JAZZ 24-7 RIGHT HERE! JUST CLICK THE BAR UNDER OUR “SPORTS INNER CITY TV” WEBCAST SCREEN. IF YOU DON’T HAVE THE ADOBE FLASH PLAYER Click here AND LISTEN TO OUR PODCASTS ALSO. NEW PODCAST COMING SOON! It looks like the NBA playoffs will be very very different this year. Why you may ask? It is because of a superstar who for the first time since 2010 will be at home or somewhere watching the games on TV. His name is Lebron James. The Los Angeles Lakers will again not be in the playoffs this season. It is not good for the NBA to not have good teams in New York and Los Angeles. The Knicks and Lakers have not made the NBA playoffs in years. When the playoffs start, iconic areas like Madison Square Garden and The Staple Center will not have NBA playoff games. If you are a NBA junky and know the history of the NBA you know that back in the day the Lakers and Knicks and Celtics were always in the playoffs. The Showtime Lakers with Magic, “The Captain’ and leading scorer in the history of the NBA Kareem Abdul-Jabbar, and “Big Game” James Worthy. And then the Lakers with big Shaq and Kobe. The Celtics won a title with “The Truth” Paul Pierce, “The Big Ticket” Kevin Garnett and former Sonic Ray Allen. The Knicks had good teams with Carmelo Anthony, But never won a title. In 2003 a kid named Lebron James came into the NBA with a lot of hype. Of course he came right out of high school. Lebron as we know has lived up to his hype sports fans. He has become one of the greatest players in the history of the NBA. So great that he might become the greatest scorer in the history of the NBA. Some right now say he is a better all time player than MJ. I am not saying this but many others are. James has won titles of course in Miami and in Cleveland. He helped bring a title to Cleveland. A city that had not celebrated a sports championship in decades. When James won the title with the Cavs, the rumors started to come out in the sports media. Will Lebron stay “at home” in the Ohio area or will he bolt out of town. Well of course Lebron made a choice and decided to move to the west coast and La La Land/Hollywood/Los Angeles and play for the Los Angeles Lakers. But this move to the west coast has not turned out well. The Lakers will not make the playoffs this season and Lebron will be going fishing during the playoffs for the first time since 2010. The playoffs will feel and look different without James this season. Yes I have always respected James as a cat who unlike MANY other African American athletes, he is not afraid to speak up on issues when it comes to the African American community. Others seem to be worried about there sponsors and their fans and how they will feel if they speak up on issues. Guys like Tiger Wood, Micheal Jordan and Shaq and others never speak up. But James and Charles Barkley and former Seahawks player Micheal Bennett and a few others speak up and use there platform to speak up on issues when it comes to the inner cities of America. Lebron has opened a new school in Akron for inner city kids. This is just great. On the court James has won four MVPs, three NBA titles and is the sixth highest paid player in league history. LB left the Cavs and signed a four year, $153.3 million contract as a free agent. But as I said earlier, the Lakers have a team of very young players and will not make the playoffs. Word came out that NBA legend “Magic” Johnson wanted to trade a lot of the young players for Anthony Davis who wants out of New Orleans. It did not happen this season. Egos on the Lakers were hurt for sure. It may happen during the off season. But their is no doubt a lot of feelings were hurt. James also got hurt and was out 18 games. So at 34 years old, James lost a year of his career basically. But Lebron has taken a lot negative press because many people think James moved to L.A. not for basketball reasons but for his ever building business empire. And ladies and gentlemen it is building big time. These are real facts. In 2015, James signed a lifetime endorsement deal with Nike worth more than a BILLION DOLLARS!, a huge deal for Lebron of course! Readers, James has made about more than $250 million in career salary. By the end of his Lakers contract LB would reach about $387 million. The most in NBA history! James also makes about $55 million per year off the court in endorsements. His $86 million in total annual earnings is second among all athletes behind only Cristiano Ronaldo. Beats, Intel, Sprite (Coca-Cola) and Kia are among LBs endorsement deals. He also had a HUGE deal with Nike check this out RIGHT OUT OF HIGH SCHOOL that was for seven years-$93 million!! Also, Lebron became a spokesman for Blaze Pizza, a company that he is a founding investor. And James is also a co-owner of Unknwn, a sneaker and designer clothing retailer. And when he was a member of the Cleveland Cavs, he brought a estimated $500 million to the city of Cleveland. You want more business moves for Lebron? He also owns a piece of Liverpool FC. Lebron bought a 2% stake in the team for about $6.5 million. His share is now worth about $32 million. 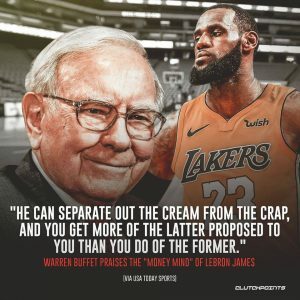 Billionaire Warren Buffett said “Lebron is savvy. He’s smart about financial matters. It’s amazing to me the maturity he exhibits.” Great thoughts about James from such a huge name in the business world and it means a lot to Lebron. He talks to Mr. Buffett all the time for advice. In 2015, his new media venture got $16 million from Warner Bros. Also, James and former California Governor and actor Arnold Schwarzenegger own part of a Bill Ackman’s office building. And despite big rumors, the NBA says James does not own a stake in Klutch Sports Agency. A company owned by childhood friend Rich Paul. By the way, the Warriors Draymond Green just signed on with Klutch. Now that one I truly think James is working with his friend Paul. James also has another childhood friend from Akron, Maverick Carter on his business team. Here is more Lebron James business moves. He helped to design a new $51,000 watch. In 2017 James bought a $23 million mansion in Los Angeles that has 10 bedrooms and a onyx bar. And he owns PLENTY of luxury cars. It is hard for me to understand why some former teammates say LB “is the cheapest guy in the NBA.” this is real crazy ladies and gentlemen. Readers I can go on and on about Lebron’s business ventures but also like I have mentioned. He speaks up on issues and also gives back. Like I said earlier, with the help of the Akron, Ohi0 (his home town) school district, he built a school with his name on it. Plus the Lebron James Family Foundation has pledged for as many as 2,300 kids to go to college. So far, over 1,00 kids are already in the program. This is great on the part of James. Just great. So with all the above off the court business moves by Lebron, a lot of folks are saying Lebron James is not really worried about helping the Lakers win a NBA title. The haters are saying Lebron moved to Los Angeles for all his business moves now and in the future. Recently after seeing James sitting at the far end of the bench during a timeout, NBA legend Walt “Clyde” Frazier said Lebron does not care about the team. Does not care about winning with the Lakers. Truth be told, it was not a good look on Lebron’s part sitting at the edge of the bench away from the rest of team. It was not a good look. So on this issue I agree with Frazier. And truth be told, I also think James moved to L.A. to operate all of his business moves. In my opinion, James said it is better for me as a businessman to be in Southern Cal than in Cleveland or Houston or Miami or other cities. Some also say James is “a coach killer” And he will help current Laker head coach Luke Walton go out the door. But in the end I CANNOT hate on Lebron James. Fox Sports host Skip Bayless is a hater against James just like Colin Cowherd is a hater of Russell Westbrook. Bayless blasts Lebron just about every day on his tv show. He hardly ever says nice things about James. The same with Cowherd regarding Westbrook. In the end in my strong opinion, Lebron James is a TREMENDOUS role model for young inner city African American kids. 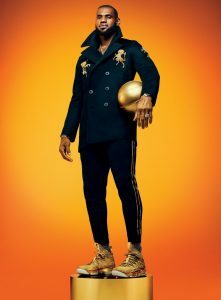 He has made millions and millions of dollars on the court and off the court but he has not forgot his roots. LEBRON JAMES GIVES BACK BIG TIME so I can NEVER EVER hate on James ladies and gentlemen. I just cannot.